PLEASE ORDER CAREFULLY TO MAKE SURE YOU HAVE CHOSEN THE CORRECT TICKETS, AND INCLUDE ALL UNDER 16s TICKETS YOU REQUIRE (2 MAXIMUM, PER ADULT), AS THEY CANNOT BE ORDERED SEPARATELY AT A LATER DATE. IF CAMPING WITH A MOTORHOME/CARAVAN/CAMPER VAN/LIVE-IN VEHICLE, PLEASE REMEMBER TO ORDER THE RELEVANT VEHICLE PERMIT. MAIN CAMP SITE HAS NOW SOLD OUT. Please note that the main camp site has now sold out. 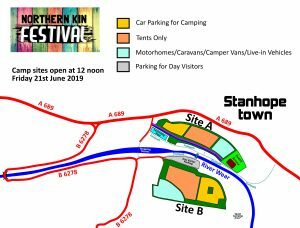 All Camping Ticket orders are now for Camp Site B which is just a five minute stroll from the main music site, across the footbridge, over the river. For the location of Camp Site B see the location map here. EVENT TICKETS can be purchased with or without camping for either Friday, Saturday or Full Weekend. They are broken into two age brackets, adults 16+ or Under 16’s for those aged 15 or younger at the time of the festival. Please note: Tickets will be posted out by registered post, so will need a signature on receipt to guarantee safe delivery, within 28 days of ordering. MAIN CAMP SITE HAS NOW SOLD OUT. Please note that the main camp site has now sold out. All Camping Ticket orders are now for Camp Site B which is just a five minute stroll from the main music site, across the footbridge, over the river. For the location of Camp Site B see the location map above or on the Event Info page. AGE RESTRICTIONS Anyone UNDER 18 must be accompanied by a responsible adult at all times and a maximum of 2 free under 16s tickets per adult is permitted, which can only be ordered at the same time as adult tickets are purchased. Under 16s tickets cannot be ordered separately. CAMPING TICKETS are charged per person and include free vehicle parking. For safety reasons, Motorhomes/Caravans/Camper Vans/Live-in Vehicles cannot park next to tents, but will be located in the Motorhomes/Caravans/Camper Vans/Live-in Vehicles section right next door to the Tents' camping area.